Workshops, Speaking and Events - iCatalyze - Seeks to catalyze your potential! 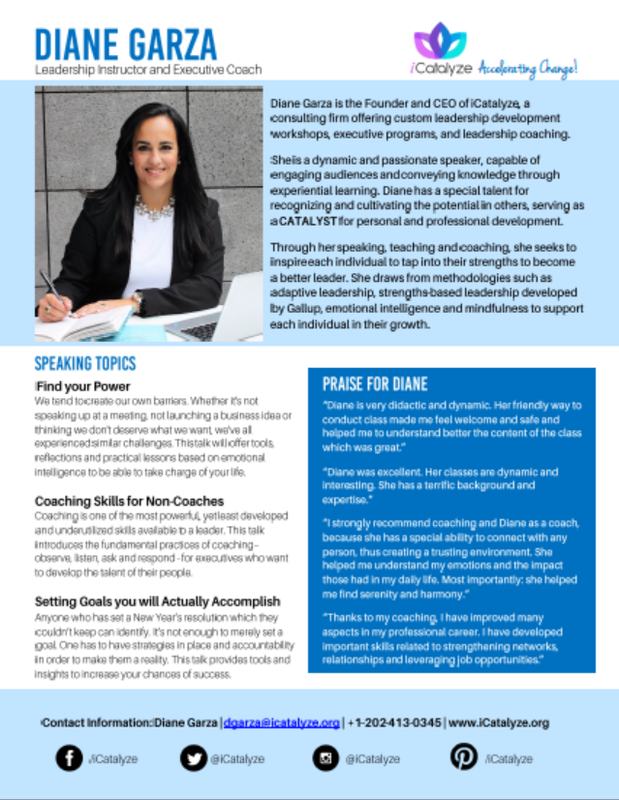 iCatalyze founder, Diane Garza, has a passion for creating innovative and interactive leadership development workshops and lectures. She can create a custom approach according to a team or organization’s needs, promoting greater self-awareness and effectiveness as well as providing new insights on the latest research in leadership. She is a dynamic and passionate instructor, capable of engaging audiences and conveying knowledge through experiential learning. Diane has a special talent for recognizing and cultivating the potential in others, serving as a CATALYST for personal and professional development. Drawing from a wide array of methodologies such as “adaptive leadership” and “strengths-based leadership,” the programs always aim to increase knowledge of specific leadership-related topics, promote greater self-awareness and team effectiveness as well as provide new insights on the latest research in leadership. To navigate highly volatile, demanding and stressful environments requires the ability to think, react and manage emotions under pressure. This workshop focuses on emotional intelligence as an essential tool for a leader and promotes self-knowledge and the construction of healthy mental habits to maintain high performance, improve well-being and foster interpersonal relationships. Coaching is one of the most powerful, yet least developed and underutilized skills available to a leader. This workshop introduces the fundamental practices of coaching for executives who want to develop the talent of their people. Anyone who has set a New Year’s resolution which they couldn’t keep can identify. It’s not enough to merely set a goal. One has to have strategies in place and accountability in order to make them a reality. This talk provides tools and insights to increase your chances of success. This workshop is based on Gallup’s extensive research of more than 4 decades and 18 million subjects, called StrengthsFinder. The objectives of the workshop are based on the study’s three keys to be a more effective leader: a) know your strengths and invest in the strengths of others, b) get people to have the right strengths in your team and, c) understand and meet the needs of those who seek you as a leader. The workshop will help participants to assess, understand and maximize their own strengths, while also integrating the results with their professional and personal goals. Additional topics include team building, communication skills and women’s empowerment. All workshops are based on an experiential learning model which provides the greatest impact for adult learners. Topics can be adapted to specific audiences.